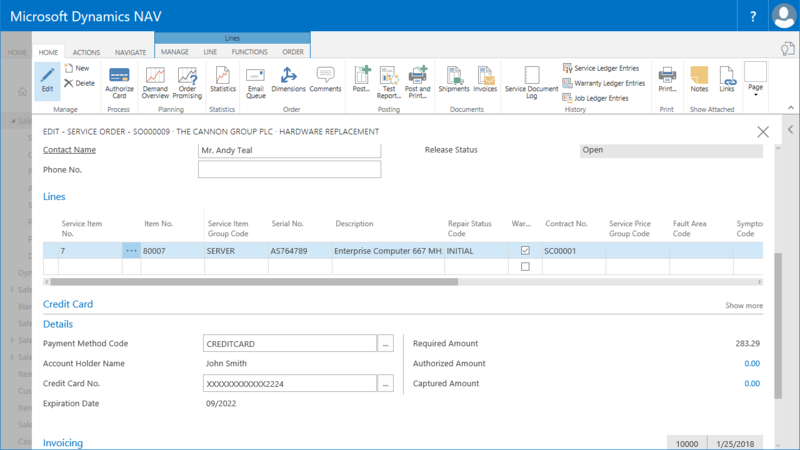 If a customer is setup with the credit card payment method and this customer is entered on an order, the default credit card defined for this customer is automatically entered on the service order. The information is visible on the “Credit Card” fast tab on the service order. 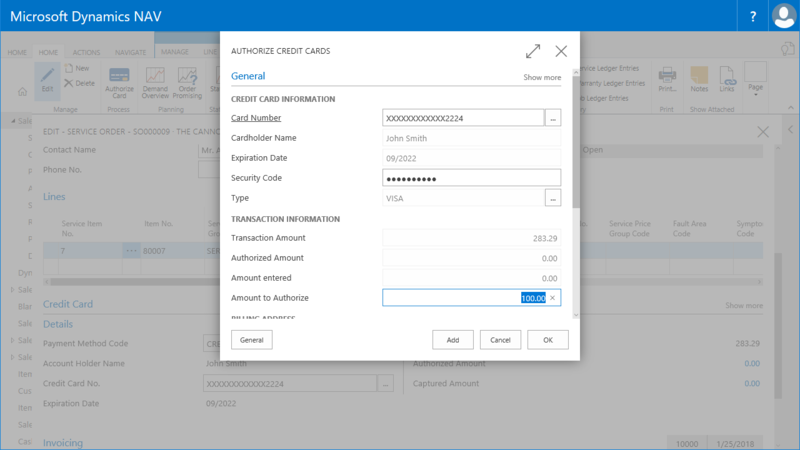 If a credit card on file is selected, the additional fields are not editable. 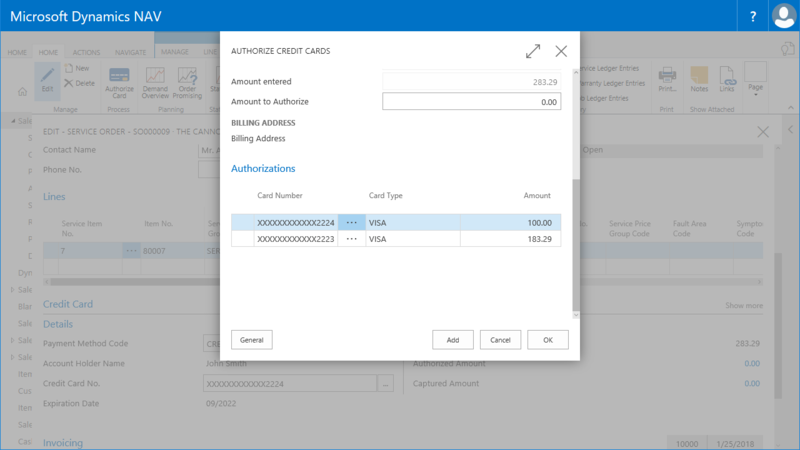 If you have setup the NAV-X Credit Card functionality with “Auto-Authorize on Release”, this is it. The credit card will be automatically authorized when you release the order for shipping and captured when you post the invoice. If you have configured the functionality to require the security code, you will have to enter the security code for this credit card at the time of authorizing. If you want to enter multiple credit cards and split the payment for this order over multiple cards, or if you have to authorize credit cards at the time of order entry, you can do so by selecting the action “Authorize Card”. If you have a card already defined on the order, you will be asked, if you only want to use this card for authorization. To enter multiple credit cards or change the credit cards, select “No”. You can select credit cards from the list of stored credit cards or you can also enter new credit cards. For each card authorization, enter the “Card Number”, the “Security Code”, and the “Amount to Authorize”, if you do not want to authorize the entire amount against one card. Then click on the “Add” button at the bottom of the page. You can see a list of all authorizations to be processed, if you scroll down in the “Authorize Credit Card” page. Once one or multiple credit cards are authorized and the authorized amount on the order matches the required amount, the order can be posted. When the invoice is posted, the credit card payments are posted automatically and applied against the invoice, effectively closing out the invoice at the time of posting.